The perfect setting for a fun family vacation for people who like to "Get away from it all"! 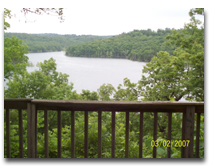 Relax and enjoy the natural beauty of the Ozark Mountains and Bull Shoals Lake. Rent the whole resort for your family reunion, private fishing tournaments, or other large gatherings. Pets welcome and free WIFI.